This is my website! Feel free to look around and find more about me and see some of my work! 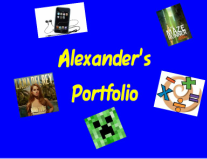 My name is Alexander G and this is an essay all about me! I really enjoy music class. I dislike science. I need to improve in physical education. I am going to tell you all about me. First of all, I really enjoy music class. When I go to music class I play the trombone and I love it. Mostly because I am very good at that instrument. I also like the sound of a concert band so music class is great for that. I also like reading, learning, memorizing the notes and reading music on a staff. I thoroughly enjoy music class. Second of all, I dislike science. I find that I just don't fully understand some of the things that we learn about in that class. Also, I extremely dislike doing projects that require building things, and in science there is a lot of projects like that. I prefer paper and textbook work. I also am not very interested in the concepts we learn is science as well. I don't like science class. Third of all, I need to improve in physical education. I really don't enjoy some of the sports we do physical education so I tend to not try my hardest and participate as much as I should and that's bringing down my marks a little. However, I do participate in the activities I enjoy. To improve in physical education I am going to try and participate in some activities more. Now you know all about me! I love music class. I dislike science. I need to improve in physical education. Thank you for taking the time to read my essay!